Rust Check is a light liquid oil-based product with active corrosion inhibitors. Its main function is to penetrate into crevices, displace existing moisture, and then keep moisture from re-entering. Without moisture, corrosion cannot occur. Coat & Protect is a thicker version of Rust Check, with the same active ingredients. It’s thickness gives it a good wash and wear resistance. The main function of Coat & Protect is to protect exposed areas of the undercarriage. Unlike traditional undercoating, Coat & Protect is non-drying, so it won't crack or peel. Coat & Protect also is an excellent heavy-duty lubricant. 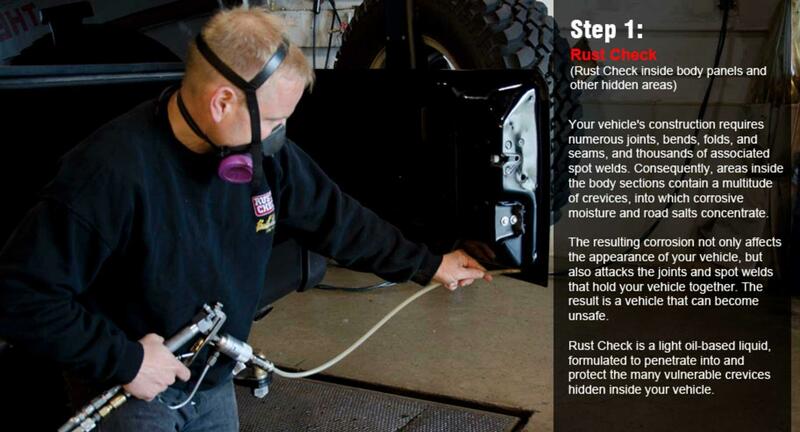 Rust Check utilizes a unique two-step application process designed specifically to provide highly effective corrosion protection by utilizing products appropriate to different parts of your vehicle. The protection your vehicle requires varies as a result of its design. One product cannot be effective in all areas. We know your time is valuable, in order to serve you better we recommend booking an appointment.